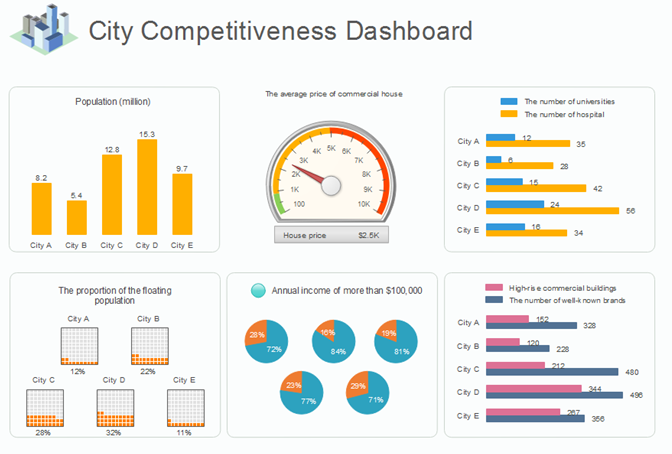 Types of charts and their uses are important for your business or daily assignments. 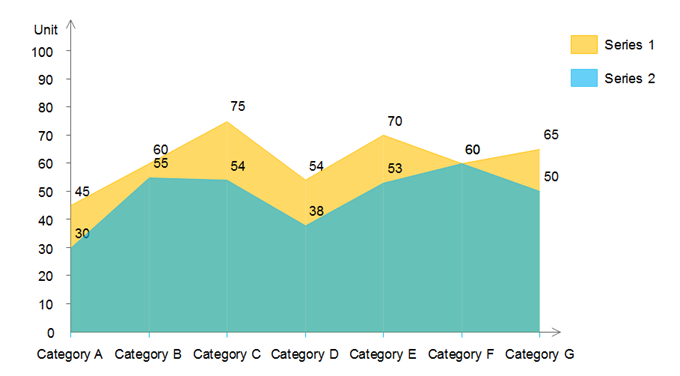 Common types like line charts, bar or pie charts can improve clarity of coursework or projects. The article will show you the top 10 common types of charts and their tips to use. 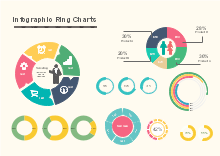 Normally the most popular types of charts are: column charts, bar charts, pie charts, doughnut charts, line charts, area charts, scatter charts, spider and radar charts, gauges and finally comparison charts. Here is a quick view of all of these types. The biggest challenge is how to select the best and the most effective type of chart for your task. If you want to choose the most suitable chart type, generally, you should consider the total number of variables, data points, and the time period of your data. Basically, each type of chart has specific advantages. For example, scatter charts are good for indicating relations between different factors or topics, while line types are good for showing trends. Column charts are very useful for the comparison of at least one set of data points. The vertical axis, which is also known as the Y axis, is often shown in numeric values. 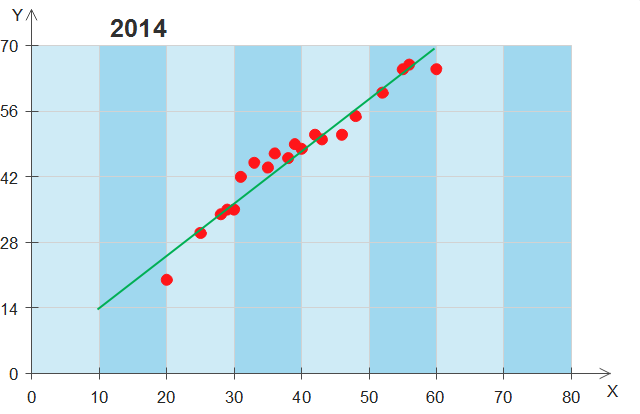 The X axis on the horizontal line shows a period of time. Normally, data points in column charts have these kinds: Flowers, Shrubs, Clustered, stacked and Trees. You can find trends over time by using these types in different colors. 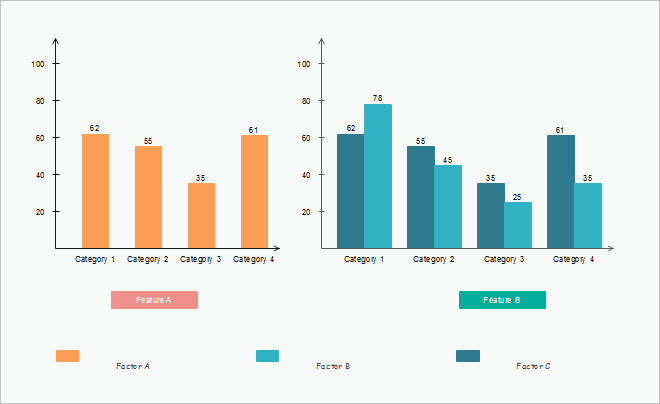 A clustered column chart is especially effective in showing and analyzing multiple data sets. For stacked column charts you can easily check a specific percentage of the overall data. 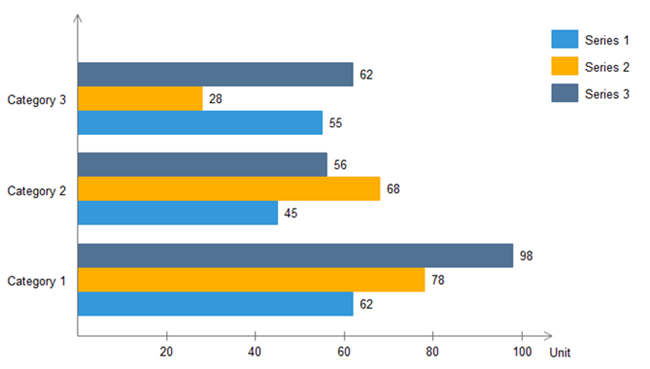 Bar charts are for comparing concepts and percentages among factors or sets of data. Users can set different distinct choice for your respondents, for example, annually or quarterly sales. You can see bar charts are similar to what column charts lying on its X axis. If you are not sure about when to insert a bar chart for your work, you should think about the specific kind of your original data and your personal preference. Normally, compared to other types of charts, bar charts are better for showing and comparing very large sets of data or numbers. 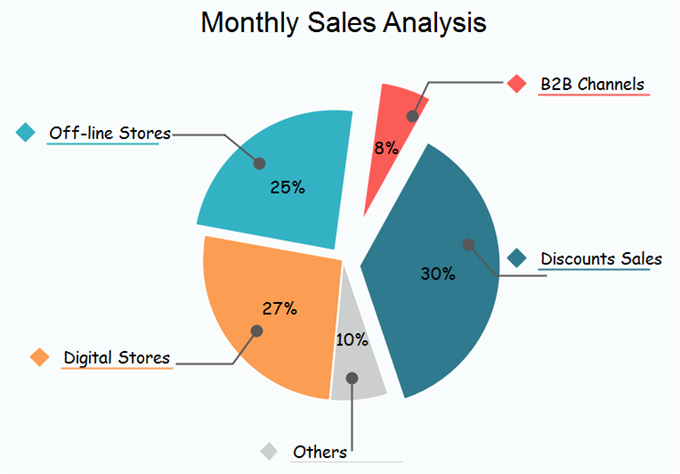 Pie charts are good for illustrating and showing sample break down in an individual dimension. It is in the shape of a pie to show the relationship between the main and sub-categories of your data. It is good to use when you are dealing with categorized groups of data, or if you want to show differences among data based on a single variable. In reality, you can break down any sample data groups into different categories, for example, by gender or in different age groups. For business projects you can use pie charts to represent the importance of one specific factor on the others. 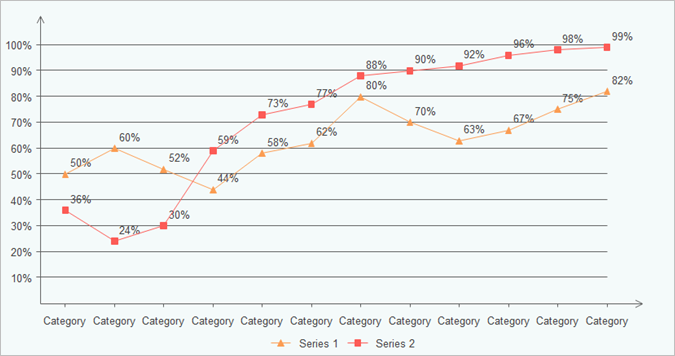 However, for analyzing several different data sets you should go for column charts. Doughnut charts are very similar to pie charts in terms of the area in the center cut out. Doughnut charts have a number of elements including the division of segments, and the meaning of arc of an individual segment. Doughnut charts are good for presenting the relationship between proportions of different data groups. In this case, users can focus on the proportional areas of the slices. Doughnuts also cover more details than pie charts via their blank space. This type of chart is normally used for explaining trends over periods. The vertical axis always displays numeric amount, while the X axis indicates some other related factors. 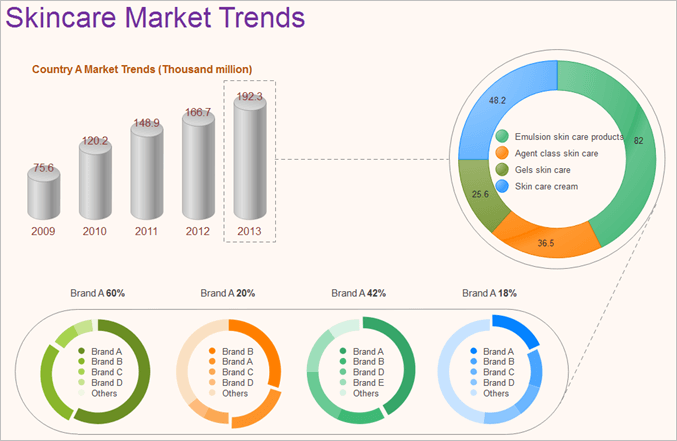 Line charts can be shown with markers in the shape of circles, squares or other formats. Line charts are not so colorful as other types of charts, but it is very clear for users to see the trend within a specific period for a single set of data. Alternatively, you can compare trends for several different data groups. Managers or financial leaders may use such charts to measure and analyze long-term trends in sales, financial data or marketing statistics. Area charts are very similar to line charts, but the former ones have solid plot lines. Area charts are ideal for displaying trends over a period for single or several categories, or the change between several data groups. Basically, area charts have two main types: the stacked and the completed stacked area chart. Both of these types can show the nature of your selected data sets. Scatter charts are ideal for analyzing how different goals settled around a main topic and their different dimensions over a time period. 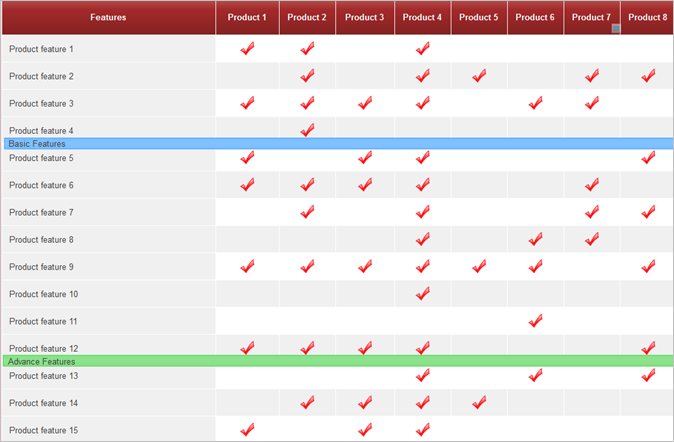 For example, you can quickly compare types of products based on budgets and selling prices. Scatter charts have some different elements: markers, points and straight lines. All these factors can indicate and connect different data units. You can choose to draw a scatter chart only in markers or lines. Generally, markers are ideal for small data points, while lines are good for large size of data points. Scatter charts have similar points with line charts since they both use vertical and horizontal axes to show different data points, but scatter types can also show the degree of difference in one variable to the other, which is known as correlation. Correlations can be positive, negative or equals to zero. Positive ones, for example, mean data increase simultaneously in most of the time based on the given time period. Spider and radar charts are also known as web charts, star charts or polar charts. If you have a large set of different data groups, using spider and radar charts are better than column ones. 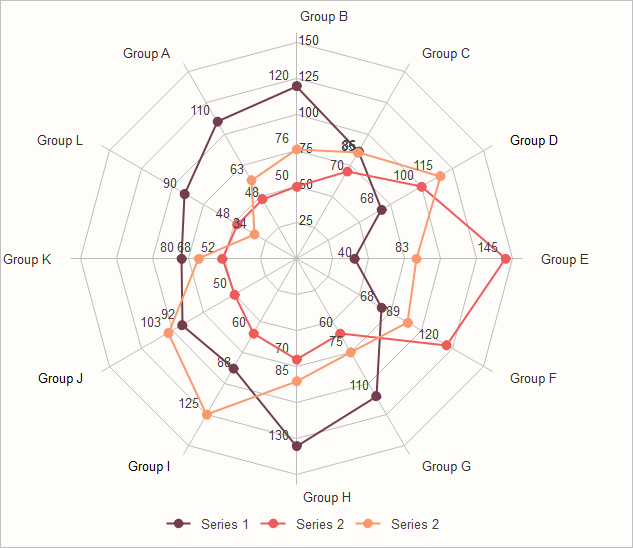 The radar chart is good for showing multiple data groups in terms of 2D diagrams of at least three variables on axes. 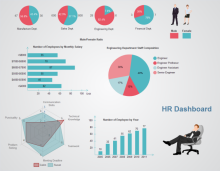 Human resource (HR) managers usually use spider and radar charts for checking skill pattern of different employee groups and their career performance. Besides, product managers in IT or trading organizations can use such charts to compare different products over a wide range of features, like showing a set of different smart electrics based on their quality, battery figures, appearance, and processors. Therefore consumers can easily and quickly choose the best option based on their own preference. Factors in gauge charts normally show as individual value. Such indicators are usually in red color for the wrong message, or in green ones for correct ones. Gauge charts are ideal for showing KPIs (Key Performance Indicators) especially for business plans, therefore they are usually used by managers or employers for ongoing assignments. The main advantages of gauge charts including: presenting improvement in a goal; showing a factor such as KPI; representing a value and meaning of individual measurement; showing details that are easy to understand. However, one of the weak points of gauges is its limitation of showing more than one data point. In this case, a column chart is a better choice. Comparison charts, which are also known as cluster diagrams, are typically for comparing between at least two objects, units, or groups of data. The chart can provide a visual comparison of both qualitative and quantitative details. Types of comparison charts including comparisons between components, items, time series, correlations, and distributions frequency. The main purpose of comparison charts is to show an outline of possibilities for different circumferences. The uses of comparison diagrams covering research topics, decision-making process for both business and science subjects. For larger organizations, decision-makers may need all-around comparison with rich details to analyze the progress of different data groups and data from competitors over time. 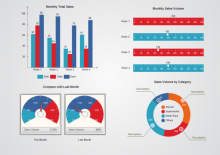 This article has discussed the top 10 common types of charts for daily life and work uses. Here you can see an outline of the most important data visualization tips. You should remove any excess details such as colors, text or lines from your charts. Try to simplify a single chart, or you can separate into two or more charts. The variables in your chart should be directly connected to the numerical units of your data groups. You should also consider about inflation when switching between different currencies. Make sure that your charts present clear and easy-to-read comparisons. Therefore, you should structure your datasets in clear order based on your selected values. Indicators are also important for highlighting your projects. Correctly insert labels on your lines, bar or pies in your charts so as to avoid indirect look-ups. Try to simplify your color categories of your charts. Use the same color in a different intensity within same categories. Make your charts have a same color pattern for same axes or labels. If you cannot see colors in your printed charts clearly, you should change existing colors. The following free chart examples and templates includes the main categories of charts for business and educational uses. Feel free to click on any of them to see more details. How to Create Your Chart Easily? 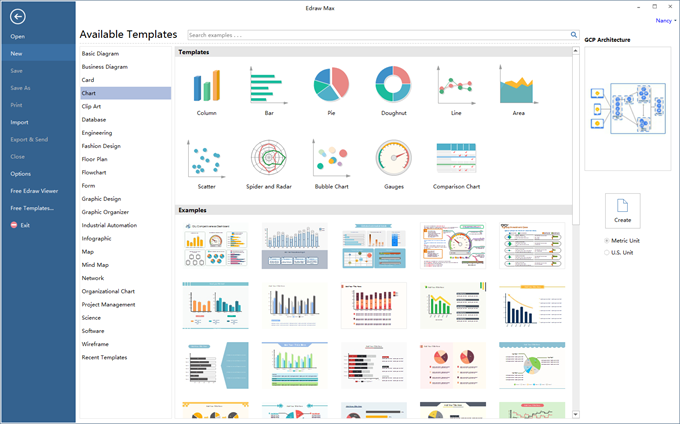 You can use some free download Interactive Chart Software or click on the download buttons at the end of this page to create visually appealing charts for both business and educational usages. Simply drag and drop the built-in templates and symbols on your drawing board, fill in texts and change themes by using the auto-create features.